This morning I had by nails done and I am so pleased with them! I had finally grown my nails nice and long, but I've started biting again unfortunately. My cuticles were in desperate need of some TLC and my hands just looked a mess really. Peeling skin, bleeding and wonky nails, great! I'm not a fan of acrylic nails myself. I think they look absolutely lovely on other people, but I think they do too much damage to your natural nails and are awfully expensive. In comparison, gel is beautifully shiny and my nails grow dramatically when I have it on. My friend Lucy owns her own mobile business, and I wouldn't let anyone else do my nails because she is just so amazing. She spent an hour in total giving them a thorough manicure, and painting them. 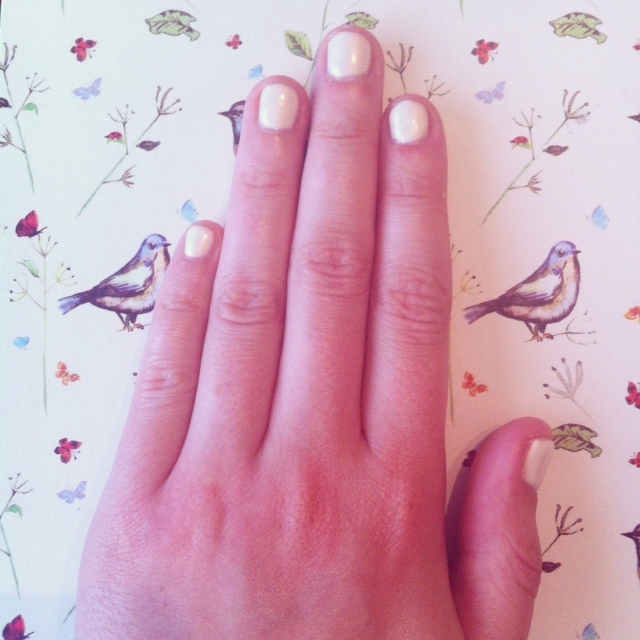 She has a wide range of colours, but I have a white obsession at the moment so it wasn't a difficult choice! This will last about 2 weeks, and at £15 she is the cheapest gel nail artist I know! And because she comes to your house, I find it so much more relaxing, which is surely the whole point of pampering! I thoroughly recommend her to anyone who lives locally to myself. Lucy also does massages, waxes, tints, and so on! If anyone would like her contact details, message me.